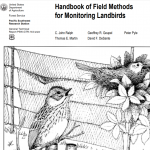 This handbook is a compilation of methods that can be used to assay population size, demographics, and status of many species of birds occurring in a wide variety of habitats. The handbook will prove useful to field biologists, managers, and scientists anywhere in the New World from the arctic through the tropics. 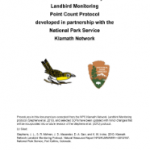 These are landbird field monitoring protocols developed by Klamath Bird Observatory for the National Park Service Inventory and Monitoring Klamath Network. The Rocky Mountain Avian Data Center supplies researchers and resource professionals with links to methodology and datasheets used to study a wide variety of birds and their habitats at different times of the year. The data center also provide citations to influential published papers regarding avian ecology and conservation, monitoring, sampling techniques, decision support tools/management and statistical analysis that may be helpful. You can find and download Bird Conservancy of the Rockies (BCOR)-endorsed protocols and datasheets on this webpage to assist you in data collection for your research or management project. 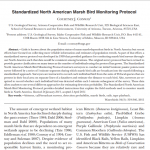 This Protocol instructs surveyors to conduct an initial 5-minute passive point-count survey followed by a series of 1-minute segments during which marsh bird calls are broadcast into the marsh following a standardized approach. 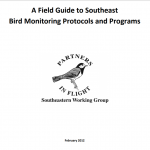 Surveyors are instructed to record each individual bird from the suite of 26 focal species that are present in their local area on separate lines of a datasheet and estimate the distance to each bird. Also, surveyors are required to record whether each individual bird was detected within each 1-minute sub-segment of the survey. These data allow analysts to use several different approaches for estimating detection probability. 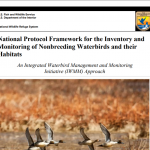 This protocol framework provides guidance for conducting inventories or monitoring surveys of waterbird habitat conditions and use at local scale in a way that will allow analysis of multiple sites from multiple regions in the Refuge System. This protocol provides a framework for rapidly assessing local habitat conditions and quantifying use of wetlands by waterfowl, shorebirds, and wading birds (hereafter referred to as waterbirds) during non-breeding periods.